Often considered the greatest guard in football history, he fought hard for every conquest. George “Moose” Musso was born April 8, 1910 in Collinsville, Illinois. He fought valiantly to play football professionally, a crusade that paid off with 11 years with the Chicago Bears. At Milliken College in Illinois, Musso started at tackle for four years. During his college years, he had the distinction of being the only football player to go up against two future presidents: Ronald Reagan of Eureka College and Gerald Ford of the University of Michigan. George Halas, owner of the Chicago Bears, spotted Musso in a college All-Star game and invited him to the Bears camp in 1933 to try out. Halas even sent Musso $5 to cover his expenses – no small gesture in the midst of the Great Depression. Musso not only made the team but he was a starting tackle before season’s end. He became team captain in 1936, a job he cherished until his retirement. In 1937, Musso switched to defense and became the first player to win All-NFL honors at two positions – tackle (1935) and guard (1937). At 6’2″ and 225 – which grew to 270 at the peak of his career – Musso cut an impressive silhouette for the time, earning him nicknames “Moose” and “Big Bear.” He was a devastating blocker and defensive standout as guard, usually occupying a few blockers at a time. 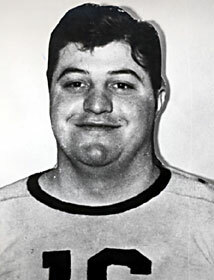 Musso stayed with the Bears until he retired in 1944. With Musso on board, the Bears won four NFL Championships – 1933, 1940, 1941 and 1943. He was elected to the Pro Football Hall of Fame and the National Italian American Sports Hall of Fame in 1982. He died on September 5, 2000.